What to do in Vegas when you don’t party, drink alcohol, and gamble? Before I went to the US, all I know of Las Vegas were the three things mentioned above – party, drinks, and gambling. At first I was hesitant to put Las Vegas on my itinerary but R said there are lots of good buffet restaurants so I was sold, haha. I first went there in 2013 and went again during my 2015 visit. So what did I do there? What do I like so much about Las Vegas that I visited it every time I went to the US? Really, our main reason the first time we went in 2013 was to eat! Being a culinary aficionado (is it even a term? 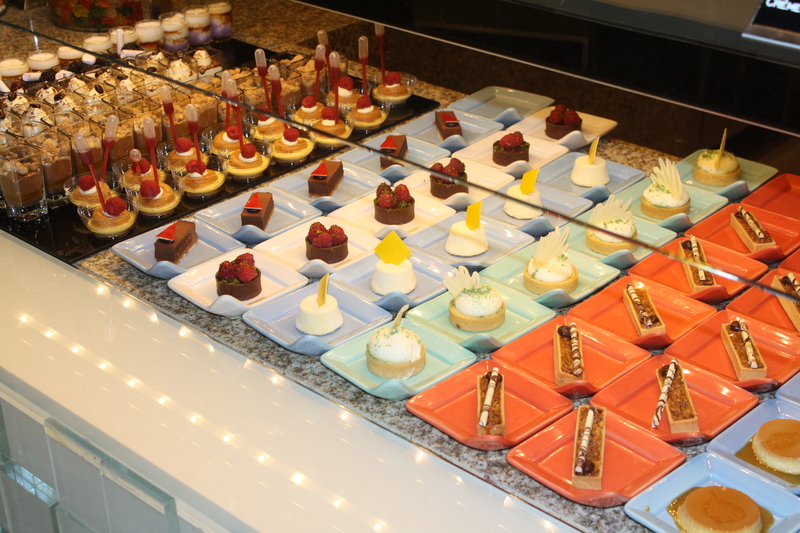 ), we wanted to try the newly renovated Bacchanal Buffet in Caesar’s Palace. It was not a wrong choice. The buffet was exceptional! Yes we had to queue for almost 2 hours because we were there for weekend dinner but once we were seated, it was worth it! (Mind you we just started dating at that time so queuing for 2 hours was no big deal for us.. we enjoyed the “quality time”, hahaha). Okay I know I should be more creative and try other buffets. After all, there are a lot of buffet restaurants in Las Vegas. Here are 5 of them – the top ones. If you are not the buffet kind, worry not for there are also a lot of good restaurants ranging from fine dining to fast food. Las Vegas is the home of West Coast’s first Shake Shack joint. It also has a branch of LA’s Sprinkles Cupcakes, Gordon Ramsay’s Burgr, and many more. This list can go on forever, but if you’re still curious about Las Vegas culinary scene.. this article on Las Vegas’ hottest restaurants can be a good start! Apart from hotels and casinos, The Strip also has numerous shops that can be your shopping destination. I can’t recall most of the shops I saw now, but I remember for sure there’s a big Sephora and H&M in one of the malls 😉 There are also some Factory Outlets (two that I remember), with designer brands’ outlet shops like Kate Spade, Coach, Gap, Nike… all the brands we love! :D. Oh and here’s the most important bit: Sales tax in Las Vegas is 8.1%, slightly cheaper than Los Angeles which is 9%! Win! Last not but least, I think Las Vegas is just the perfect place to relax. It is a good weekend destination if you’re living in nearby states. If not, well there’s always a reason to visit, for sure. Book yourself a nice room, enjoy the facilities, good food, and city lights. You can watch a concert, see Cirque du Soleil, watch stand up comedy or magician.. or even just people watch! There are just so many things to do for everyone which do not have to involve the three things I mentioned in the opening of this post. Christa, aku pingin banget ke Las Vegas buat hiking di sekitarnya. Katanya bagus banget, apalagi buat pencinta batu2an dan gurun 🙂 Oh iya, Grand Canyon juga ga jauh dari sini. What happened in Vegas stay in Vegas. Dari dulu penasaran juga kenapa ada quote terkenal seperti ini….kuenya bikin ngiler lho. Ngantri 2 jam itu sambil berdiri terus ya? Ga ada kursi buat duduk2 gitu Chris? Huahaha disangka ngantri disalon 😅 wahhh pasti enak banget itu makanan sampai 2 jam dibelain *jadi laper bayangin makanannya. Air mancur yang paling bawah itu terkenal bangat yach. Sering muncul di TV sama Caesar Palace juga, kayaknya icon Las Vegas bangat.